I've been going back and forth over whether or not to write this post, or how to write this post, because honestly I need to post about something other than whining and I feel like I may have reached my whining quota for the month of April sometime a week or so ago (so I'm going to try to write another post after this one, that isn't pathetic or whiny... feel free to skip straight to that post once it's up!). Then again, I'm not sure how much of that complaining has been external here on the blog and how much of it has managed to stay in my head (or has just been taken out on poor Paul who's trying to get ready for finals). I have very grand ideas when it comes to "offering it up." I always have an idea of prayers and intentions during labor and I always fall way, way short. But the flu? It's not labor. It's not even close to labor. You'd think I'd at least be able to manage that. But no. I can manage it for an uncomfortable five minutes on and off. Like if I'm bundled on the couch not moving. Then I just end up thinking about how much I hate being sick. Anyways so last night would have been one of those awesome offering it up nights. If you're squeamish you may want to skip the rest of this post because it involves blood, although not miscarriage type blood, thank heavens. I didn't call the doctor yesterday because I woke up feeling slightly better. Not a lot but a teeny, tiny bit. And I thought that I was likely on the upswing, and going to my regular doctor would be silly and I'm waiting until Friday to see my OB, so I might as well just wait until then if I'm getting better. At least that was the logic that convinced me not to call my primary care doctor yesterday after a week of the flu. Instead I found myself vomiting blood at 10:47 pm, while Sadie and Mae, who happened to wake up at exactly that moment, began to scream together, hysterically (I can't even remember the last time that happened!!!). It wasn't a lot of blood and it wasn't particularly scary to me. I have an ulcer that has come and gone over the years since college. 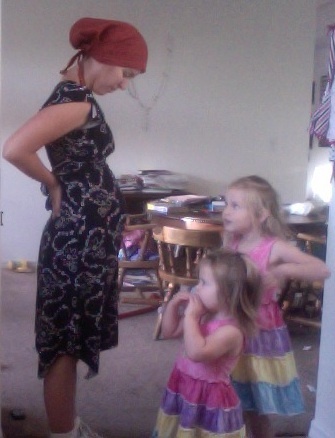 When I was pregnant with Sadie I was throwing up blood clots the size of quarters. These were teeny tiny baby blood clots, followed by a slightly bloody nose that led me to believe this might not even be my ulcer, but the result of blood from my nose going into my stomach when I was asleep (or however that would work). I called Paul at 11:22, because he was still studying in the library, with the girls still crying although I'd been in their room for quite a while, because Sadie was worried that I was sick and worried about the baby (the kid misses nothing, despite my explanations that it's just the flu...) when I realized I just needed to hang out in the bathroom for a while. He heard the words "vomiting blood" and wanted me to go to the ER. I rolled my eyes and said no way. I've been to the hospital eight times in the last nine months. At this point I think I'd have to have some sort of a broken or dangling limb to cause me to go voluntarily, unless my doctor is actually sending me (or have a baby related problem... see I'm just not good at going in for me!). Thankfully the days aren't bad. I feel okay in the mornings when the girls play. I start to crash in the afternoons when Paul gets home (how can you crash when you've been laying down all day?!?!?!). And then I get sick at night which usually isn't bad, unless both girls for some reason wake up, creating the perfect storm. And so that's the latest bed rest update. Since the flu seems to be dragging on it looks like I'm going to get another shot at offering it up. Maybe this time I'll do better! You should definitely call the doctor ASAP and let her decide if something is an emergency room worthy problem. You should have called the doctor when you first threw up blood just in case. I hope your doctor can see you in the morning!